Hope: What do you think it's going to be this time? A cyclops, slender man? Santa? Alaric: Well, given our luck, I think it's safe to rule out old St. Nick. Hope: I don't know. I mean, Santa Claus is kind of terrifying when you think about it. Breaks into your home. Sees you when you're sleeping, not to mention judgy. Hope: Look, I'm trying, I just wish that Satan's night light would give us some rest. Alaric: Yeah, and I wish that knife wasn't in our school, to begin with, but it's not like we can change that now. All we can do is make sure we're not blindsided by another monster waltzing through our doors. 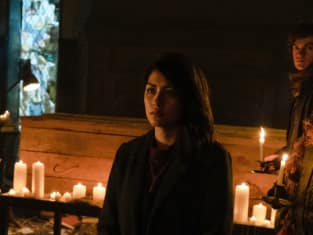 Legacies Season 1 Episode 10: "There's a World Where Dreams Come True"
Legacies Review: Who is Stefanie Salvatore? Alaric: I sleep with the damn thing under my pillow. It's kind of hard to miss. Permalink: I sleep with the damn thing under my pillow. It's kind of hard to miss. Legacies Round Table: Should Klaroline Take Over the World?